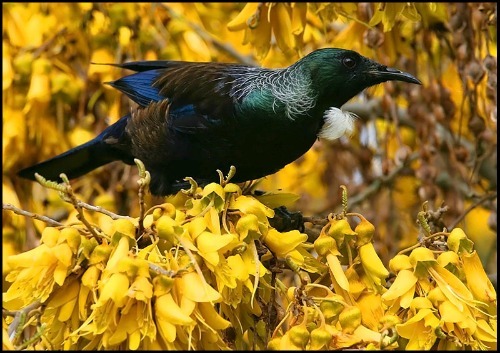 The best and most popular native tree for attracting tuis is the Kowhai (Sophora tetraptera). It is easy to see why – have a look at the photos below. 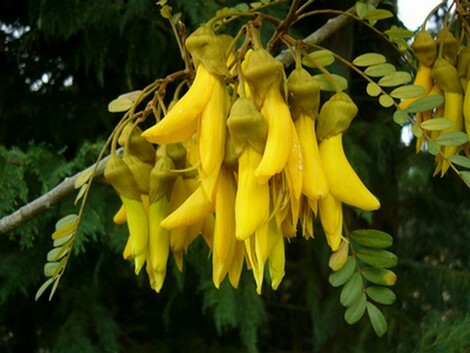 The Kowhai’s trunks and main structural branches usually grow in a broad vase shape. This makes it very easy for a qualified arborist (tree surgeon) to prune the tree into an upright vase to help it fit into smaller areas. If space allows, the Kowhai tree will naturally grow into a beautiful rounded canopy. The Kowhai has very small rounded leaflets which give the tree a feathery look when it is in full leaf. The flowers are yellow, hang downwards, and are similar in shape to a pea flower. 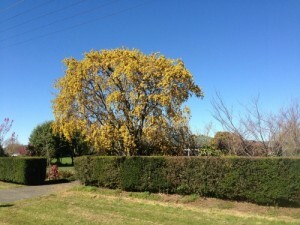 The Kowhai is a semi-evergreen tree, which means it loses all its leaves just before flowering, which occurs in spring. 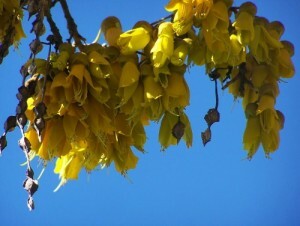 Kowhai flowers in a blue sky. The Kowhai usually bear large numbers of flowers which smother the branches in a mass of golden yellow which is absolutely gorgeous, especially with a blue sky behind! The green, blue, and black of the tui make a striking cotrast to the bright golden yellow of the Kowhai flowers. As shown in this photo, the Kowhai bear a profuse number of flowers. 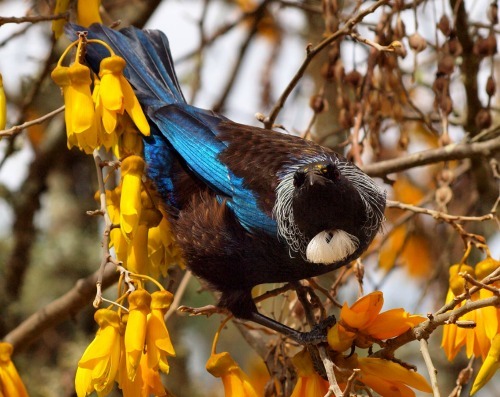 The Kowhai flower is the perfect shape for the Tui to insert their beak to sip the nectar. It is not uncommon so see the birds hanging upside down as they feed. 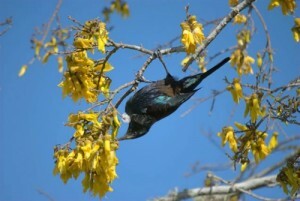 Another photo showing the beautiful golden yellow of the Kowhai flowers contrasting with the blue of the tuis foliage. The Kowhai is undoubtedly one of New Zealand’s most beautiful and well known native trees. It is most commonly seen in gardens as a small to medium size tree up to 10 metres tall. If you would like to know more about the Kowhai tree, please let us know.